Rumpole of the Bailey is to lawyers/law students (former and present) what P.G. Wodehouse is to the common man. Being a former student of the law, I find Mortimore incredibly witty. I'm not sure that just anyone would enjoy Rumpole unless you've had some experience with the law. If not, you might find a lot of the subject matter confusing to downright tasteless at times. (I, myself, do not find certain aspects of the law as tasteless as others. I think I've been conditioned.) At any rate, Mortimer has a quick wit if you enjoy that sort of thing. I was first introduced to Rumpole by an attorney I worked for. I was presented with a few episodes of the television show to watch, as an after work assignment, which I have to say I thoroughly enjoyed. I enjoyed the book no less, although I was predisposed to read Rumpole with the tone of voice and inflections which Leo McKern gave the character in the BBC series (not a bad thing). Each chapter tells the story (written from the first person perspective) of one of Rumpole's cases. He relates to you the facts, the presentation and the personal life (married to She Who Must Be Obeyed) as they relate to himself. The characters are all very believable and, I say again: "WODEHOUSE-ian." I'd heartily recommend this book to anyone, although I do realize it might not appeal to most. However, you might just care to give it a try. It wouldn't hurt. Well I can say I'm not a lawyer and love Rumpole, it is the dry British humor that gets me. I fell in love when we brought home some of the tapes from the library. Wonderful stuff and you are right rather P.G Wodehouse like. Thanks for pointing him out to the world. I have taken Rumpole books on our long vacation (no TV) every year for a long time. I have had to repeat, having long ago read them all. 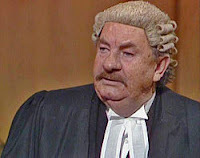 Rumpole's affinity for the common man, and his dedication to the "golden thread" that runs through all of British jurisprudence, make him a hero, to me. Whether he is "rearing up on his hind legs," purchasing a bottle of "plonk," or commenting at length on his wife's taste in hearthrugs, he is colorful, heartwarmingly human, and uniquely himself. I was happy to see your review.